I hope you're having a lovely morning! I am so excited to bring my first gift guide to you! 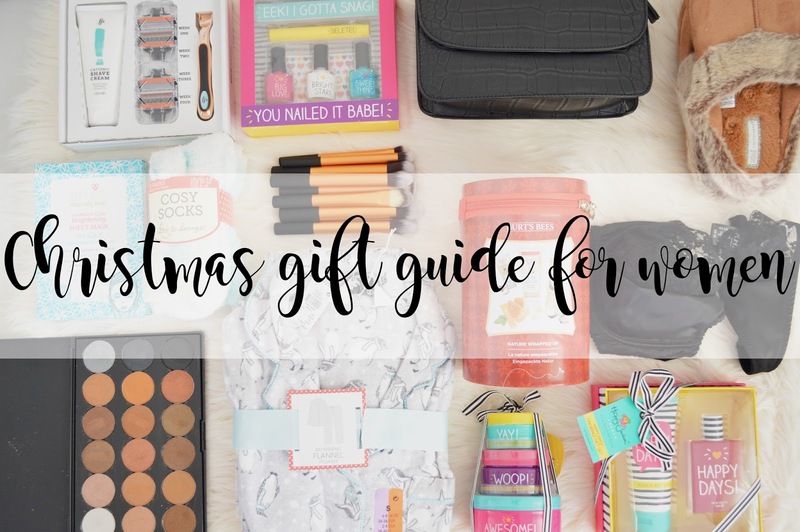 I have never created a gift guide on my blog before, nor have I ever participated in Blogmas so we're killing two birds with one stone and I couldn't be more ready for this experience! Today is the day where I share my Christmas Gift Guide for Women. This guide includes products of all price ranges and there is something for everyone (or at least, I hope there is). I included items in here which I knew I or even my friends/family would love and I hope you do too! I absolutely love this brand for their brushes, they're soft and excellent for blending various products! If you're interested in buying Real Techniques brushes but they're not in your budget, definitely check these out as they're a brilliant replica! "Unwrap Burt's Bees gift to you, courtesy of Mother Nature! Discover Shea Butter Hand Repair Cream, hard working Coconut Foot Cream, nourishing Milk & Honey Body Lotion & the classic 100% natural Beeswax Lip Balm with Vitamin E and Peppermint"
Burt's Bees is an incredible brand for natural products and I've heard they are amazing for skin conditions too because of the natural beeswax. This is a wonderful gift to get a friend or even family member, a girl just cannot go wrong with hand cream, foot cream, lotion and lip balm! I know I use these four products every single day. Coconut Body Cream; Massage into skin for instant loveliness! Super Scrub; Massage into skin and rinse off for super-smooth awesomeness. yeah! Watermelon & Mint Bath Salts; Add a handful to a warm bath, kick back and relax!" Happy Jackson is a wonderful and affordable brand for women and girls! I'm sure some of these products a man would love too! I know my boyfriend would use a few! One thing I love about Christmas is being pampered and gifts like this are the best for the days when you want to pamper yourself, have a bath, moisturise and generally take care of your skin! If skincare products isn't for you then Happy Jackson have a wonderful "Happy Days" Fragrance Gift Set too! Not only does this include a fragrance in a gorgeous apple scent but it also includes a body lotion too; so you're getting the best of both worlds! If you're buying gifts for Secret Santa at work or school, this would also be a perfect gift! "Give your nails some yeah! With this awesome selection of manicure and pedicure". I really love the names which Happy Jackson come up with and this is the "You Nailed It Babe, Nail Polish Set" How cute! As a lover of nail polish I know this would be a perfect gift for me! And I'm sure my mum would love it just as much! Not only does it come with three polishes, but it also has a nail file and a "delete" pen which I've never found in any sets before! brighten, hydrate and revitalise your skin. Use them once or twice a week to bring an instant radiance and revitalising boost to your skin while you relax". Face masks are another way of pampering and making yourself feel good and I feel like face masks are the one thing which we forget about buying for ourselves, I definitely forget to buy them! So here's your chance, buy a face mask for someone!
" I’ve got 5 beautiful blades, and a vitamin E lubricating strip to give your skin that silky finish. I’ve got a capacious wide soft rubber guard for lifting hairs up, whilst my pivot helps me glide gracefully around the contours of your body. My guard trimmer can neaten up those hard to reach spots too - so you’re ready for the beach…or the bedroom". Does anyone else use the standard multi-pack of razors which you can buy in Tesco? You know the ones I mean, the Wilkinsons ones. Yep I do. I know after seeing the way my legs shred up that a good quality razor is important, especially when you shave often! I personally have bought razors for three different people this year because I know they're fed up of the standard ones which you can buy in supermarkets. You need to look after yourselves and this is another step to doing that! There's not much to say about these! If you have cosy socks from Primark then you'll know how cosy and comfortable and warm these are! I try and make sure that everyone get's me a pair of cosy socks for Christmas just so I know I'm stocked up. They are the one essential in life when it comes to feeling cosy! "Easy to match your every look! Glossy color and nourish ingredients together. It is in excellent quality and so versatile and convenient to use, easier to use! Buy it as a gift for anyone, ideal for professional use or personal use". So I mentioned about the Nurbesten makeup brushes and I can't help but mention their 18 eyeshadow shimmer palette. I mentioned this in my Autumn Makeup Post if you're interested in finding out more about it but it is what it says! 18 beautiful shades, perfect for Autumn and Winter. They're easy to blend, they are extremely pigmented and just look at them! Perfect for anyone this Christmas. Pyjamas are my absolute favourite thing to wear. I'd rather go out in public wearing pyjamas than an actual outfit because it means I'm comfortable and cosy and I can feel like myself! Primark are the best place for Pyjamas, especially if you're looking for flannel ones too. For only £8, you can buy a pair for everyone this Christmas! Slippers, the extra part of feeling cosy at home! Fluffy socks are incredible but they are also dangerous if you have wooden or shiny floors! So slippers are your next best friend! I use these day in, day out. And when they're a bit knakered, I go back to Primark and buy more. They are so comfortable, so fluffy and I cannot go a day without wearing slippers! How gorgeous is the colour as well? "Our Sophia Bra combines luxurious vintage details with modern wearability. This bra is designed to create a timeless and elegant look that offers exceptional support and comfort. Composed of vintage inspired black French lace with silk, the Sophia thong is a barely there piece that is ready for any occasion." I cannot mention a Christmas Gift Guide about comfort and pamper without including a lingerie set. Personally, I think if you're going to pamper yourself to feel good, then you want to look good as well right? Katherine Hamilton are right, this lingerie set gives you all of the support you need but it's comfortable! Some bras out there are so uncomfortable and you just can't wait to get them off but it isn't the case with this set! A bag is a girl's best friend, and shoes of course! And the KoKo Couture Darla bag is perfect for anyone who is like myself that if they have a massive bag, they will fill it to the top till the point it's far too heavy to carry around! I fell in love with this bag when I saw the purse on the back, genius! My purse is probably the heaviest item in my bag and this means I no longer have to carry it around with me. Get yourself a Darla bag or your friend or family member! It's the best invention ever. "Celebrate this festive season with this elegant bouquet of scented white oriental lilies, white chrysanthemum blooms with green hypericum berries and avalanche roses". Flowers are the last thing which I think is perfect for a pamper and comfort day, they bring such a wonderful vibe to any room and I feel like it's because it's a living plant maybe? I'm not sure, but they're a wonderful gift for anyone! I thought this Winter Wonderland Bouquet was perfect for Christmas as it reminds me so much of snow (and hopefully we'll have some this year). Let me know what you loved most about this Christmas Gift Guide for Women! This blog post features product/s which were sent to me for the purpose of this guide however all opinions are my own and completely honest.